Recent advances in digital computing resources have made the analysis of large nonlinear rotor-bearing systems practical in a desktop computing environment. With modern personal computers and workstations, it is now possible to perform large time transient numerical solutions of nonlinear models that previously could only be approximated as linear systems due to limitations in computing capabilities. 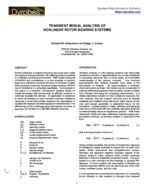 Summarized in this paper is a transient rotordynamic analysis based on modal techniques that incorporates an efficient model for a nonlinear squeeze film damper. An application is presented in which the analysis is used to predict nonlinear unbalance response in an aircraft turbofan engine for the optimization of squeeze film damper and bearing support characteristics. The efficiencies of the modal approach yield typical run times of less than 20 minutes on a 300 MHz desktop computer.